Discovering neuroscience was a revelation to me. It taught me that we are not the slaves of our past. We have the capacity to change every day, every minute, to reproduce new neurons until our last day. We don’t have to possess bad character; we are not our traumas. We are not our past. We are not our mental habits. We can change now, immediately. This is not wishful thinking or fantasy. It is the reality of human neuroplasticity—our ability to alter our brain’s neural synapses and pathways—and it is achievable through the practice of meditation. Our brain is a muscle, and every day is a chance to develop the brain. We can further build and enhance our character, our determination, our happiness, our intuition, and our freedom. To train your mind and to meditate can become the ultimate revelation of your life. Yes, you can! Yes, it is possible! Everyday when I see my students, and when I see the people I am working with at the Amity Foundation—a community rehabilitation center in Los Angeles that is dedicated to the inclusion and habilitation of prisoners, parolees, children, and families marginalized by homelessness, poverty, addiction, crime, racism, sexism, trauma, and violence—it makes me cry. I see how simple it is, in reality, to make a difference. Our false perception of meditation. The cliché of the monk who meditates for many hours in his shrine or on a mountaintop has encouraged a false perception of the practice. This standard image has made meditation seem unachievable, because our daily lives are not in sync with the fantasy. We must learn that to meditate and to train our minds is possible in just a few minutes per day, anytime, and anywhere. We must see how every situation in our life is an occasion to train our determination. the quest of losing weight. We know it is possible, but to make the effort and be disciplined is too difficult, especially in the midst of our daily stress. How can we find the energy to meditate when we have no energy left just to live our lives? How is discipline possible when we are very busy and overbooked every day? Why must discipline be sad, strict, and negative? Discipline means freedom. Every day, we can take a few minutes to feel better. We develop a near chemical addiction to happiness, peace, and a quiet mind. We need only a few minutes to meditate every day. The most important goal here is not the quantity but the quality of the practice. In just one minute, we have the ability to touch our soul and the spiritual dimension. We can be connected to the eternity of the universe in a very short amount of time. We must prioritize the quality of our meditation practice over the duration of it. Every situation is a wonderful occasion to meditate, to feel at peace immediately. Every time we wake up in bed is an opportunity. Every coffee we have is an opportunity. Every moment in traffic is an opportunity. the bus is an opportunity. Every time we arrive at our workplace is an opportunity. Life is like a movie; there is a start and an end. After each new movie, each new moment is a new reincarnation. Life keeps going on. Most of the time, we are the actors in our life movie. We are directed by our emotions and our mental habits. To practice meditation opens the mind to another perception of consciousness. Day after day, we become less the actor and more the director. When we practice and we train our minds, suddenly one day we will be out of the movie, out of the set, and out of the screen. We will find ourselves sitting down at the front row of our theater. The goal of meditation is not to become more spiritual or religious. It is to become more present, calmer, happier, and freer. These are the goals of this life, after all. 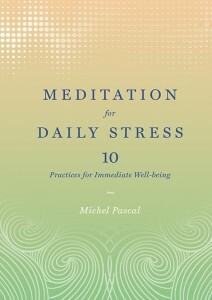 Michel Pascal is a French author, meditation teacher, singer, filmmaker, and photographer. 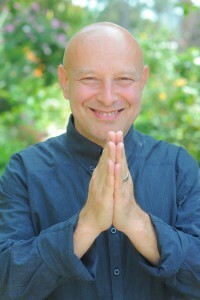 Michel’s unique brand of meditation is being practiced at Google, Harvard University, and many other major organizations. Before moving to the United States, Pascal lived in the Kopan Monastery in the Himalayas. He has spent more than 15 years adapting traditional teachings and practices for students around the world. Pascal lives in Los Angeles.